Summary: What happens when middle school students are invited to explore grammar check tools in an intentional way as part of a teacher inquiry project that connects to instruction? 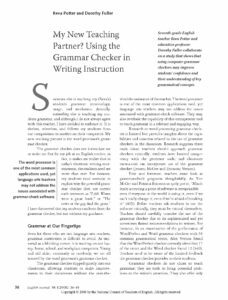 The authors describe their process and the benefits: students became more informed users of the tools and more confident writers, and they made explicit and intentional connections to grammar concepts. This article could be included as a resource in a professional development program or study group focused on finding authentic ways to incorporate grammar into writing workshop approaches. So which error types did they want to study first? Many students suggested we study passive voice because they see it all the time when typing at a computer but did not know what it meant. I told them that choice was interesting because passive voice first appears in our standards in seventh grade, so it would be a great unit to choose. They also proposed to study comma use because it appeared so often in their documents. I explained that we could focus our comma study on compound and complex sentence structure, one common area of difficulty for both student and adult writers. For the final unit I persuaded students to study subject-verb agreement based on how difficult these errors can be for the grammar checker to detect. It is also one of those difficult areas for both adolescents and adults. Copyright © 2008 by the National Council of Teachers of English. Reprinted with permission. Potter, Reva, and Dorothy Fuller. 2008. “My New Teaching Partner? Using the Grammar Checker in Writing Instruction.” English Journal 98 (1): 36–41.